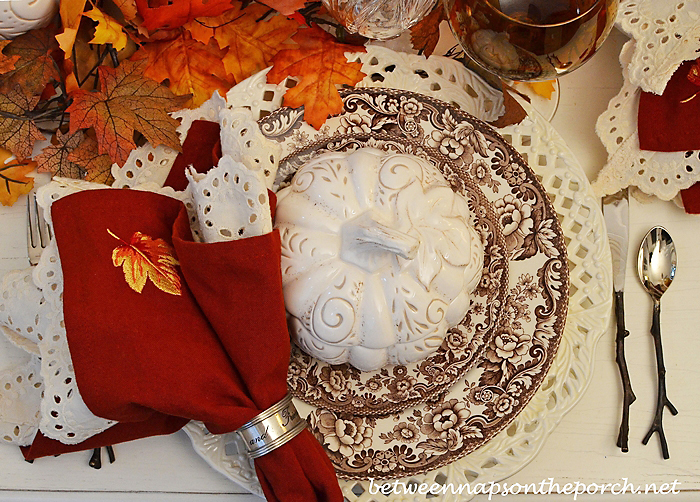 Welcome to the 268th Tablescape Thursday! Happy Halloween! Are you ready for the Trick or Treaters? Have you been sampling the Halloween candy this past week like I have? You know that’s necessary, just to make sure it isn’t stale or anything. Okay, remember when I decked out the hutch on the screened porch with pumpkins for Fall? For this week’s Tablescape Thursday, it was time to get those cute little pumpkin tureens off the shelves and put ’em to work. Pumpkins are so much fun to use in decorating or on the table because they work great for fall, Halloween or Thanksgiving. You can just see a wee bit of fall color on the trees in the backyard, now. The individual soup tureens at each place setting are from Pier 1, this year. 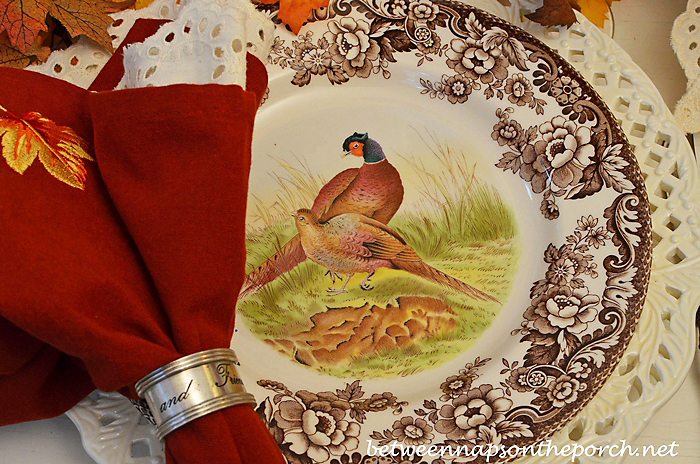 I’m using one of my fave dishware patterns for fall, Spode Woodland. The colors are just so perfect for this time of year. I used two mercury-glass pumpkin lanterns (found in Marshalls) in the centerpiece, you may remember them from last year. The lanterns are on either side of a large soup tureen in the same pattern as the individual tureens at each place setting. 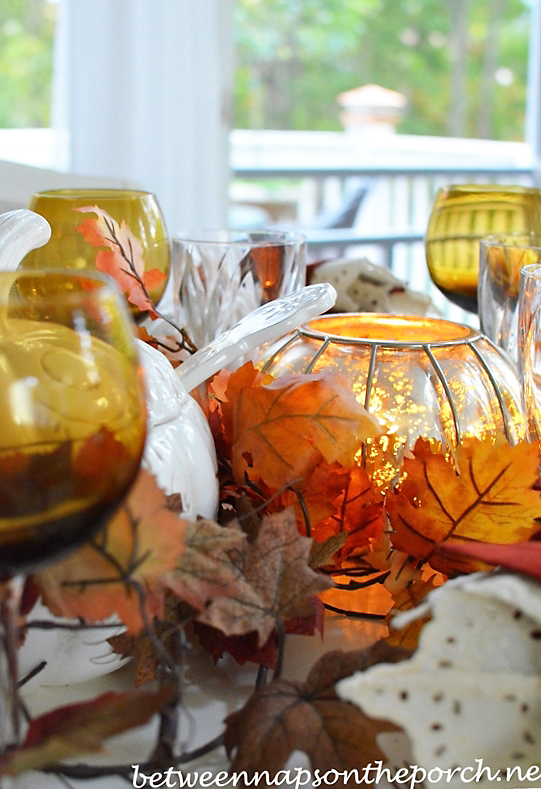 Once lit, the pumpkin lanterns reflected the colors in the tablescape. 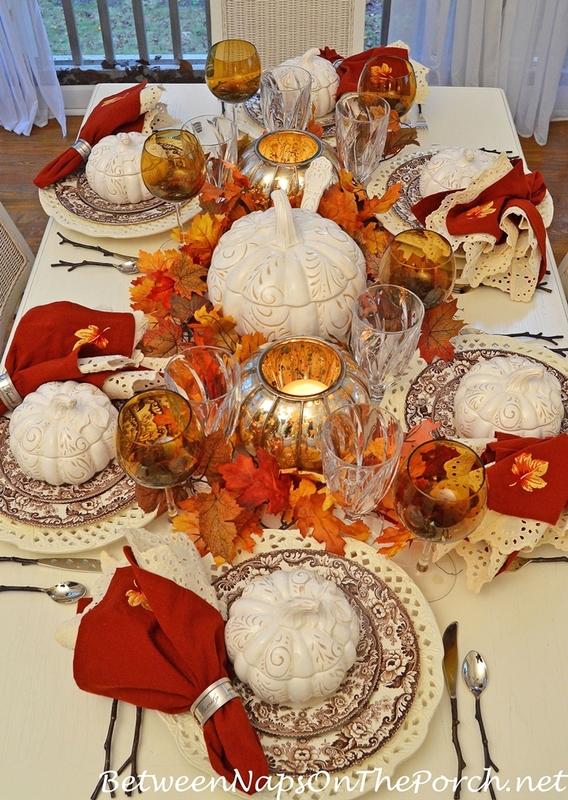 You’ll find more Halloween, fall and Thanksgiving table settings under the “Tablescapes” category at the top of BNOTP. Gorgeous tureens Susan! They’re beautiful paired with the Spode Woodland! P.S. I really like your ‘carousel’ method of linking, I see something new every time I visit! Beautiful Susan, as always:-) Thanks for hosting!! 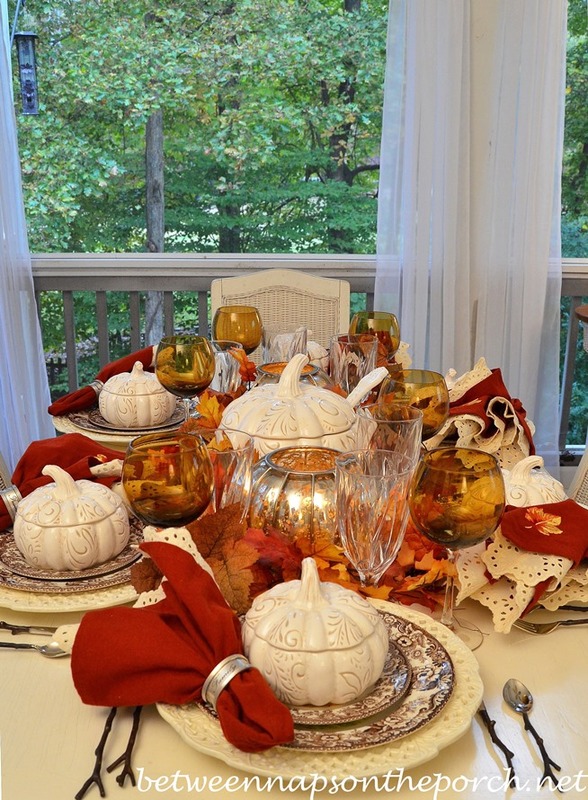 Beautiful table and this weather is perfect for sitting on your porch to enjoy a Halloween dinner. Love all the colors, and those napkins are great! I love how Mr. Blackbird is keeping a watchful eye from the table with the lamp. I also think I should visit pottery barn more often. We have one in an outlet mall nearby. My honey probably won’t be too excited about that! Where did you find your chargers? They are super versatile. Thanks again for hosting. lol Sandra, you have good eyes, girl! I had forgotten I put him over there until I was going through the pics last night to write the post. Watch for the PB sales, that’s normally when I shop there. Outlet is even better! The chargers are from Neiman Marcus or Horchow about 6 years ago, before I began blogging or even knew about blogging. I think I bought them from Horchow. NM and Horchow carry pretty much the same stuff and are owned by the same parent company (I think) so I have trouble remembering now which one I purchased them from. They need to bring them back again! Oooooo, I love your Spode Woodland dishes paired with all that creamy white, Susan! Very, very pretty tablescape! Thanks for hosting TT again & again & for inviting us into your home each week to see what you’ve been up to. Your table is just stunning Susan, I have been trying not to covet your pumpkin tureens~they look beautiful with the pierced white chargers and the Spode Woodland china! 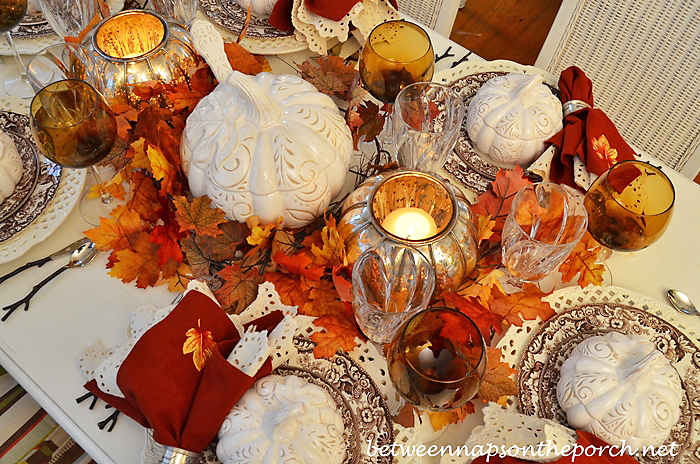 Just gorgeous with the mercury glass and falling leaves…I am hosting Thanksgiving this year for the first time in years so I am going to go check out all your fall tables from the past for more inspirations! Thanks for hosting and Happy Halloween! Thanks, Jenna! 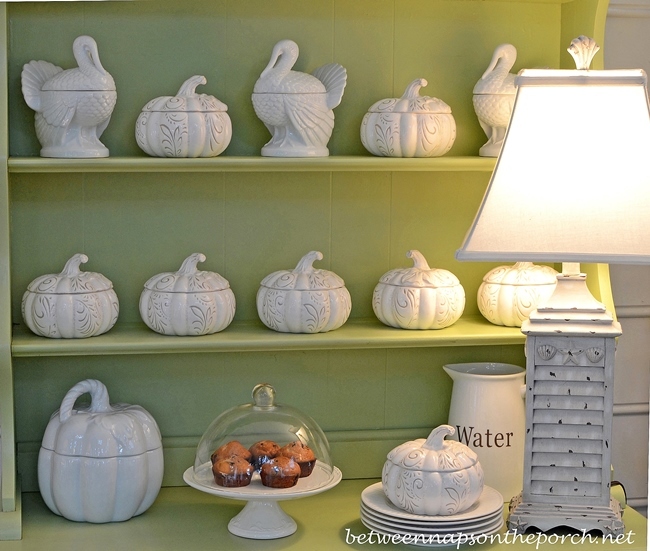 I’ve been looking for white pumpkin tureens for several years so had to get these when I spotted them this year. Check Pier 1, not sure if they still have them but if they do, they may be on sale by now. Like Jenna, I’ve been trying not to covet your beautiful dishes! The Spode woodland is something I think I’ have to put on my Christmas list! They are beautiful! I was lucky o score some lovely individual pumpkin soup bowls from a local potter! I found a couple more, very similar at Tuesday morning . I’m using them on the mantle until I need them on the table! They are too pretty to not display! Thanks for keeping on inspiring me! Gorgeous table!!! I would love that tablescape on my porch. Here in Pittsburgh the trees are simply blazing with fall color. This is one of the most vibrant fall leaf seasons in years. Where did you get the silverware??? I notices the handles are twigs. How awesome for fall!! As always, your tables are inspiring and trigger many ideas. I have recently discovered HomeGoods which I know is one of your go-to sources. We just got a couple of stores in the “Burgh and I checked them out last week. WOW! I was too late to indulge in items for Halloween and Fall. I picked up some fall dishes though and got the jump on Christmas! Thanks for hosting, being so encouraging and creative and instructive with your tutorials. Gloria, I love that silly flatware. It was a bit of a splurge, looked at it for a long time before I finally bought it. I purchased it at West Elm and it was on backorder at the time. Had to wait about 5 months for them to get it back in, but it was worth the wait. It comes in several colors. I went with the darker brown color since it looked the most like real twigs. 🙂 Oh, you are going to love HomeGoods! Always something awesome in there. So beautiful!! Love your gorgeous table with your dinnerware and white pumpkins. Happy Halloween!!!! One question for you Susan. When you buy dinnerware or individual serving pieces- how many do you buy ? Do you buy for 8 people ? Or do you sometimes buy less ? My china collection seems to get out of hand. I went too crazy for Christmas and have four sets of 12 . Christmas is only 1 month a year ! Thanks Peggy! Well, that has changed a little over the years. I used to “think” I HAD to buy everything in sets of 12, in case I wanted to have a big dinner party and invite that many. Since I usually just have 6 or 8 for dinner, I’ve started buying china in just sets of 6 or 8. Sometimes I’ll buy and extra dinner plate or salad plate, just in case I drop one or break one some day, especially if I know it’s going to be a very hard-to-find-later pattern. I’ve come to love mixing different sets together so I figure, if I do have a large dinner party and invite more than 6, I’ll just use two different sets of dishware…so much more interesting that way, anyway. 🙂 HA! I know what you mean about Christmas dishware. I had just 1 for many years but over the years I’ve purchase more in thrift stores, in HomeGoods and on eBay. I have a weakness for holiday dishware. Maybe you could do what I used to do when my son was home before he went and grew up on me. I would swap out my everyday china from my kitchen cabinets for my Christmas china and use it starting around Thanksgiving. You could use a different set every week starting in November. Or, just use it all year if you like. Wouldn’t that be fun to have dinner at someone’s home in June and be eating on Christmas china. 🙂 I love it…but then I’m weird! … went and grew up on you, lol. Awww. I have some wintery dishes that I use year round. I just love them and they’re perfect ‘every day’ weight dishes. It makes me smile to see the snow and sleds and trees when it’s 96 degrees in the shade in June. 😀 I guess I’m weird too. Thanks Susan! Just bought 9 plates today from a consignment shop. I think it is an illness. – I like your reply about mixing small sets. Not quite ready to use Christmas year around . But I do like the idea of one different set each week. Thanks again for your reply! With 5 sets of Christmas china, I’m a big fan of Christmas in every room in the house. By December 1st, our everyday fall dinnerware is replaced in the cabinets with 3 of those sets (Spode Christmas Tree being the one we use in the dining room & a set of square red plates being used at the breakfast table). Being currently addicted to your site, our plate collection has grown considerably (now have 3 sets of autumn plates). Currently buying things in sets of four(4); know I should buy 8 but just can’t stretch that far now. Following your lead, have purchased several sets of four(4) salad plates to be used with other basic dinner plates. Current searches: the white lattice edge chargers and Lenox Christmas “bird” salad/dessert plates. Susan, you have a beautiful home that is being graced by your loving touches. Susan, your table is stunning! Warm and inviting! I like the way the lace on the inner napkins echoes the openwork in your charge plates and also like the napkins with the leaves. Everything ties in so nicely. Thanks, Megan! You notice all the little details…I love that! Happy Halloween to you! Thanks for hosting this great party.. This is so pretty! I really like those little soup tureens and they look perfect with your Spode Woodland dishes! So neat the way the carousel posting happens, at first I didn’t know what was going on! Thanks for hosting! Gorgeous table, Susan!! I love those tureens, and the mercury glass works perfectly! Another beautiful table on the porch. I am trying to get a roof on my deck and screens. Because of the big tree next to the deck and the cables that come into the house, I can’t get anyone to do it. That’s the joy of living on a farm and if you want to have good internet and TV you have lots of antenna’s and wires. Carol, I hope you can find someone. I know, it’s killing me that I can’t attend one of those. She is just so far away! Thanks, Carol! That would be so much fun! This is just beautiful. It is full of lovely things to look at without being overdone! Susan – love those mercury glass pumpkins!! Of course, Spode Woodland is always perfect for this time of the year. Our leaves have barely started to turn – I am definitely ready for some beautiful fall leaves! Thanks for hosting. Awesome tureens! Love the Spode. Such a classic. HAPPY HALLOWEEN dear Susan!!! Thank you so much for the great party and for having me twice today! I have a Halloween table and a dinner party. Have a great witches evening, please do not be scared! Wow, you are cooking, Fabby! 🙂 Thanks! Your table is gorgeous. 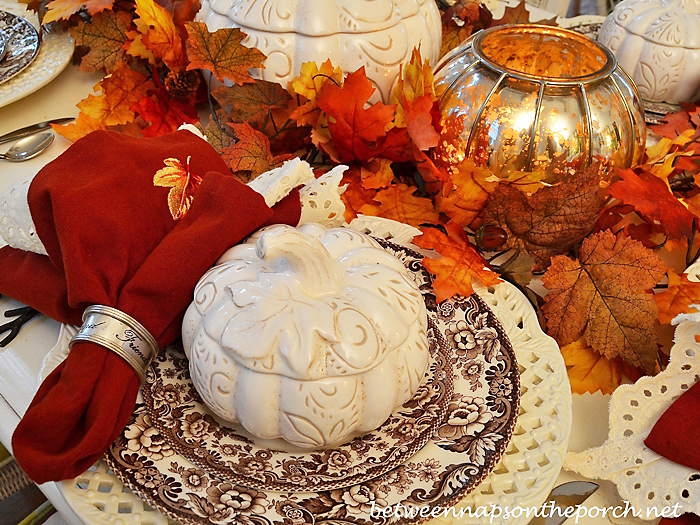 I love Spode plates and they look great with the pumpkin tureens. Hi, Susan. Lovely as always! Just wondering … is there a reason you’re no longer posting where your tablescape items were purchased? I was curious as to where you purchased the mercury glass pumpkins. Also from Pier 1? Thank you for any info. Hi Carolyn, I’ve been finishing the post sooo late at night, I just have been leaving it off. Are you missing that? The mercury glass pumpkin shaped lanterns were purchased last year (or was it the year before) from either Marshalls or TJ Max. I’ve used them previously so I need to look back at that previous table to remind myself where I bought them. Okay, just looked back and the first time I used those pumpkin lanterns was in Oct. 2011 and I got them at Marshalls. I thought it was Marshalls but since Marshalls, TJ Max and HomeGoods are all owned by the same company and carry a lot of the same stuff, I get them mixed up. I doubt they have them now but check those stores each year because they usually get a lot of mercury glass things. That’s normally where I find my regular (non-lantern) mercury glass pumpkins, too. Thanks, Susan. You’re the BEST!! Lovely as always. I’m just curious–Do you really own all the items you show us, or are they borrowed/lent? Yup, have never rented or borrowed anything. I’d be afraid to borrow something for fear of breaking it. I try to add new pieces throughout the year to mix and match and create new settings. Interesting. Where do you store it all when not in use? Susan, well done! Love your collection of pumpkin tureens. They are perfect with the Spode Woodland plates. I recently picked up 3 of the Spode turkey plates at a real bargain. Decided to pass them along to a friend who gives a different one to each of her sons each Christmas. She decided to start them a set now, so that when they have their own homes they’ll have a complete set. Great idea! 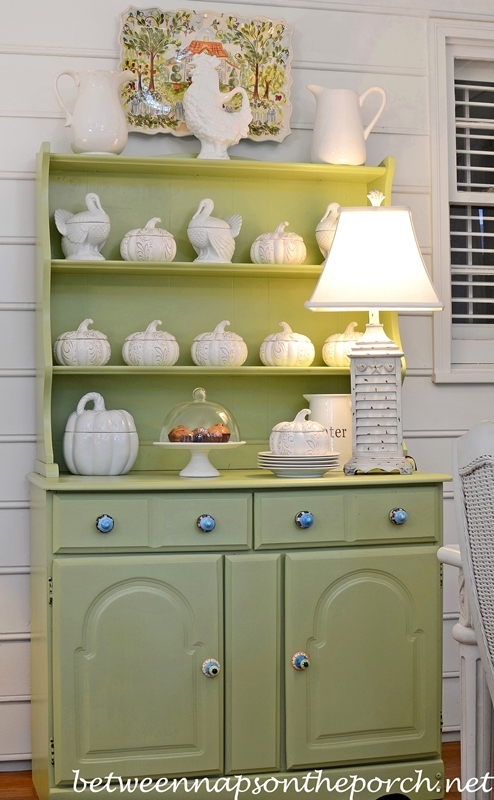 I love those tureens in the hutch but also on your table! 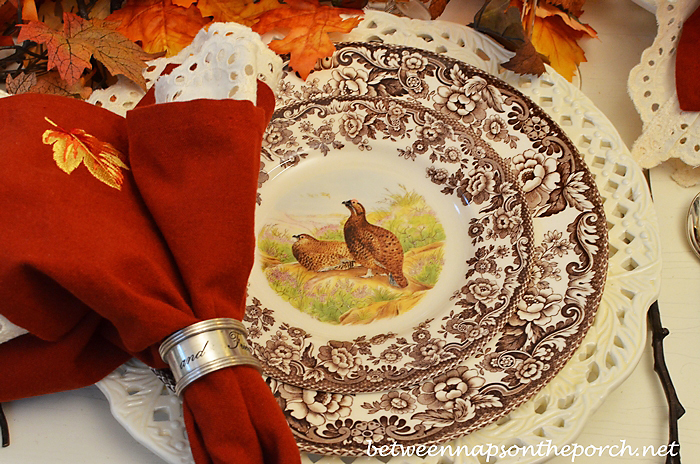 Spode Woodland is a favorite pattern of mine too and I love seeing how you’ve used them here! 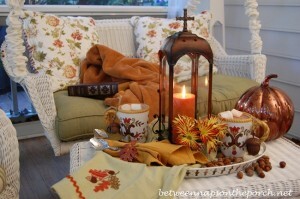 How I’d love to sit at this table with two of my favorite fall decorating items: pumpkins and brown transferware. Beautiful! Oh I love this- very warm and cozy! 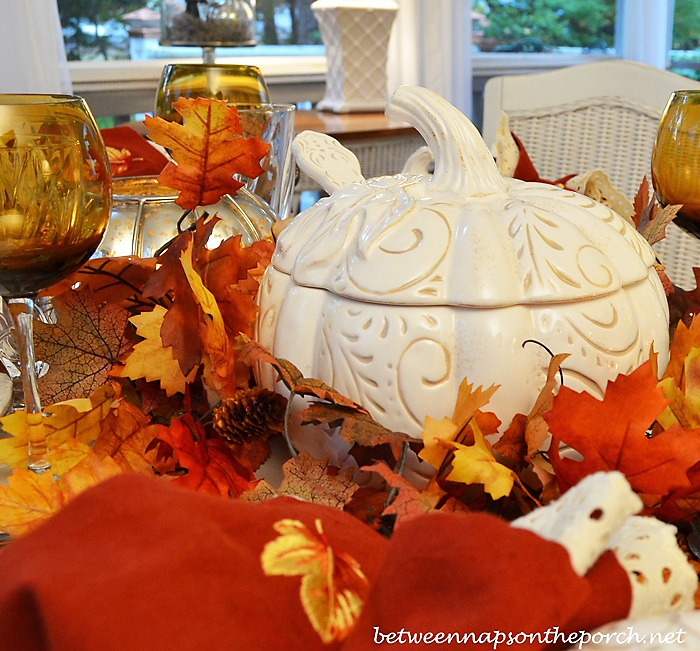 The pumpkins and those dishes would be perfect for Thanksgiving too! I want to get some of those Spode pieces. Everything looks fabulous for all 3-Halloween, Fall or Thanksgiving. I love the Spode Woodland and was able to purchases 2 of the platters for my niece for $10 each at Tuesday Morning this Summer on one of the huge markdown sales. I love the raven in the background and also your amber wine glasses-do you remember where you found those? Gorgeous Susan….not sure which way I love the table more….in the beautiful sunlight or in the light of dusk with the beautiful lanterns lit…either way…the table is stunning as always…I have always admired that Spode pattern…Our leaves now are just starting to beautifully pop with lots of color…seemed to do that overnight!….Happy Halloween Susan!! Your white pumpkin tureen is gorgeous!!! This is such an elegant tablescape, dear friend!!! 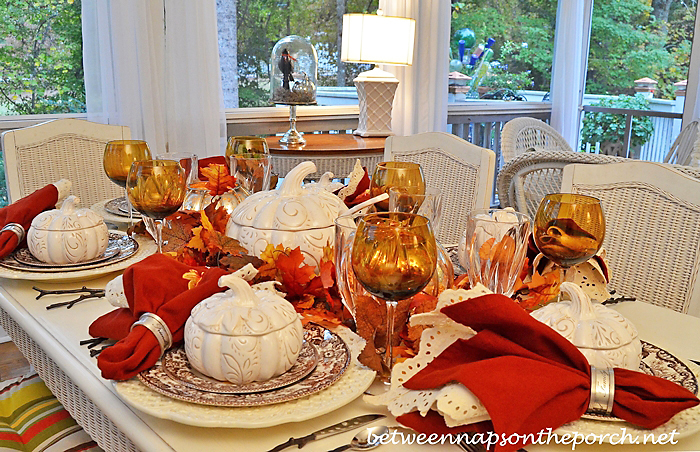 I adore how the color coming through the pumpkin vines accents the brown & white dinnerware! and the vibrant POP of orange. . .a magnificent Autumn Tablescape, indeed!!! Your table is beautiful and I love the Spode Woodland settings. I imagine the inspiration came from your recent jaunt to the mountains ! I would ALMOST, give up my first born for the Spode pattern. (just kidding he’s a good kid ) I love them both so..
You need your own magazine…….Why isn’t traditional home hiring you???? Hmmmm, note to self…email TH and suggest that idea! the table is so warm and inviting, I imagine that your guests must linger for hours after dinner! I saw Spode Woodland at Tuesday Morning this week and was so tempted… We don’t usually celebrate Thanksgiving in our home as we have had Thanksmas in Ohio with my family for over 30 years. I don’t have any turkey day dishes, but these are certainly beautiful. Thanks for hosting! Susan: You inspired me to get the Delamere Brown last year. Thank you for showcasing these beautiful dishes again! What a lovely table! Oh, and I also had to go out and get the Spode Woodland flatware after seeing it on your blog as well. Clearly, you are a terrible influence on me! Please don’t stop! Oh Susan, simply beautiful – love it all. Oh Susan, this table is exquisite! I love the tureens. They are SO pretty. And the pumpkin candle holders are fabulous. Thanks so much for hosting. I am so glad to be doing tables again. PS, forgot to say: I love how you are mixing up the links that are posted. I can never get here on time so it REALLY seems to help. Also, where did that wonderful flatware come from? I really love it! Thanks, Pinky! The feedback has been really good on the “random” setting for the links. That’s what InLinkz calls it…random. I’m so glad you like that! I like it, too. There’s a big ole story behind that flatware. It was a bit of a splurge. I normally buy my flatware at places where I can find it really discounted, like Tuesday Morning, HomeGoods, etc… but I had been wanting some twig flatware for ages. I ordered it from West Elm last January and it was on backorder for 4-5 months. Unfortunately, when it arrived, it was missing pieces and had extras of others. Can’t remember now, but I think I had a bunch of extra forks but was missing some knives and spoons. I’ve talked to another friend since then who also ordered that flatware and the same thing happened to them…missing pieces. Weird, huh? It took two calls to finally get the replacement pieces. It was worth all that trouble though, I do love it! If you sign up for emails from West Elm, they give you 15% off your first order. It was on sale, plus I got 15% off and free shipping. So watch for free shipping. It goes with so many of the tables I love to create so I find myself using it a good bit. I just noticed when I went to the site it say 10% off for signing up for emails…I was thinking I got 15% off. Also, they have free shipping going on today and the flatware is on sale. This is a lovely, inviting table! Love the brown and white Spode Woodland pattern! Makes you wish Fall would never end! So true! Seems the older I get, the more I like this time of year. I love your table scape. Those Spode plates are perfect for autumn. On Thursdays, I feel somewhat like a child at Christmas as I jump out of bed, run to the computer, and “unwrap” your Tablescape Thursday settings. Love this Spode Woodland tablescape (haven’t really found one of yours that I didn’t love). BTW, my favorite new word is tablescape – did you create the word (it’s not recognized in Spell Check )? Since I started following you in September, your site has been very good for my local Pier 1. Since I have very little creativity, my dining room table looks almost like one of your postings. Mine has a Fitz & Floyd Pheasant tureen surrounded by leaves; with Pier 1’s “Asheville” dinnerware – the falling leaves pattern this year. My husband is a bit more subdued than I am over this newfound passion. As for your mantle/tablescape/hiding under a cloche Ravens, a dear friend (in a different state) found 3 of them in her local Hobby Lobby, called me immediately, & the Ravens are on their way to a new home. All of this is to say, Susan, you have wonderful taste, creativity, & obviously know how to make every day special. Thank you for sharing your talents with all of us. Oops…must run…on my way to Pier 1 to get the white individual tureens. Did you get the turkey tureens from Pier 1 another year? Thanks! You are so sweet…made my day with your comment! You gave me a giggle about your hubby! lol If you don’t find the pumpkins in Pier 1 (may be gone by now) check for them online. I purchased the large tureen online and they shipped it to one of their stores for me to pick it up, so shipping was free. I tell you, I am in love with crazy little ravens! They may be my fave fall/Halloween decoration of all time. I don’t what it is but they are just so much fun and they feel so well made! You will love them! Those turkey tureens were a lucky find. I found them in Old Time Pottery a few years ago. I’ve never seen them again in there but you never know. They are by American Atelier at Home and the box they came in says, Athena Turkey Collection. You may be able to find them on eBay or at Replacements.com. Replacements is actually one of my Sponsors so you’ll find a link to them on my sidebar. About the word, tablescaping…I definitely didn’t create the word, but I have no idea now where I first heard it. I bet it was either on TV or in a magazine. I LOVE that Fitz & Floyd Pheasant tureen…had my eye on it for a while. 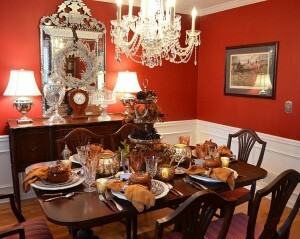 I know you Thanksgiving table is going to be stunning! 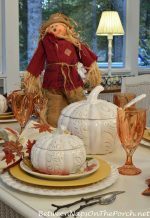 You are a gracious and talented lady Susan..Fall is my favorite season for decorating and I love your color combinations for the Pumpkin table. I do have a question that I don’t believe has been addressed – I’ve been trying to tell what the cloched item is on the side table and next to the lamp. As you can tell I look at everything beyond your main table too. Thanks for leading me to the close-up of the raven in the cloche! I love it. I only found out about HomeGoods a few months age and I am so happy that it’s far enough away that I can’t go there on the whim of the moment. I could spend all our retirement monies in that store, so I’ll just dream through your beautiful posts and ideas. Thanks again. I love Spode Woodland. Gorgeous table setting. I love, love the twig flatware. So stinking cute. Thanks for all your beautiful tables!